Road safety management of standard car fleets is generally well regulated and well understood. But this is not the case for grey fleets – vehicles used for work that are not owned by the driver’s employer. As more industries increase their use of grey fleets, concern about managing the safety risk from using grey fleets has also increased. Grey fleets are often a blind spot for organisations and workers, because it is not yet commonly understood who is legally responsible for their safety. As a result – and although WHS laws and other legislation apply to grey fleets – drivers and organisations employing them often do not fulfil their safety responsibilities. The National Road Safety Partnership Program committee partners have identified grey fleets as a significant risk with unique challenges and brought together 25 partners to collaborate on a guide to managing grey fleet safety risk, as well as researching the legal implications. In this panel discussion, three of the partners, together with legal and regulatory experts, share their insights and experiences with grey fleets. They discuss what grey fleets mean to their organisations, and individually the concerns that they have and issues you should consider if your organisation uses grey fleets. This seminar is relevant for businesses that use grey fleet, managers and leaders, regulators and WHS professionals and representatives. Tania is the Dean of Law at Flinders University, where she has taught tort law for many years. She has a background in private legal practice, including representing plaintiffs in motor vehicle personal injury litigation. Rachel is the Health, Safety and Wellbeing Systems Manager for the Commonwealth Bank of Australia (CBA). Rachel’s role includes development and continuous improvement of the Group’s Health, Safety and Wellbeing Management System globally. This includes Health, Safety and Wellbeing key risk initiatives, and implementation of the Group’s Health, Safety and Wellbeing strategy. Richard has broad ranging experience which includes fleet management, procurement, contract/supplier management, project consultancy and mechanical engineering gained in both the not-for-profit and telecommunications industries. He has over 28 years’ experience managing fleet, including leading large and complex fleet functions at a state and national level, encompassing fleets from 600 to 25,000 units. Lonnie Toia is the Australian National Health, Safety and Environment Manager for global pharmaceutical company Sanofi. Lonnie’s previous roles include Operations Manager at GrainCorp and Performance Rugby Manager at Queensland Rugby Union. Shane is a registered psychologist with tertiary qualifications in occupational health and safety and organisational psychology. Since 1999, Shane has worked across a number of strategic and operational roles at Workplace Health and Safety Queensland, within the Office of Industrial Relations. Darren is a Principal Scientist at the Australian Road Research Board, in their Safe Systems team. He is a registered psychologist with over 15 years of road safety research experience and currently delivers the National Road Safety Partnership Program (NRSPP). 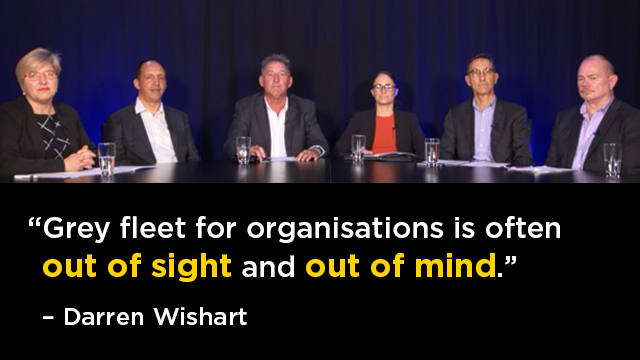 Hello, and welcome to the National Road Safety Partnership program's thought leadership panel session exploring how organisations from different sectors safely manage their grey fleet. What is grey fleet, you may ask? Why is it a concern to organisations? And what is the National Road Safety Partnership Program? This event is sponsored by Safe Work Australia as part of Safe Work month. Before I touch on those questions I'd like to introduce myself. My name is Dr. Darren Wishart and I help deliver, along with Jerome Carslake, the National Road Safety Partnership Program, or commonly known as NRSPP, proudly managed by ARRB. NRSPP is an industry-led initiative which aims to assist Australian businesses and organisations to not only improve the safety of their workers but also help reduce the nation's road safety trauma through unity and collaboration. NRSPP is funded by the major states and NHVR. Joining me today is an incredibly diverse and experienced panel, including associate professor Tania Leiman, Dean of Law at Flinders University, Rachel Gunn, Health, Safety and Well-Being Systems Manager at Commonwealth Bank, Richard Schuster, Group Manager, Procurement, Fleet and Sustainability at Church of Christ, Queensland, Lonnie Toia, National Health Safety and Environment Manager at Sanofi and Shane Stockill, Manager Manufacturing, Transport and Logistics, Workplace Health and Safety Queensland. Our topic today being explored with this panel of experts is grey fleet, which is defined as the proportion of work vehicles used for work purposes owned by the driver or another entity rather than being directly provided by the organisation employing that driver. Grey fleet for organisations is often out of sight and out of mind. As a result the NRSPP steering committee partners identified it as a major risk with unique challenges. Over the last two years NRSPP has collaboratively developed a guide to assist organisations in managing their grey fleet safety risk and a research paper exploring the legal implications by Tania Leiman. The collaboration involved 25 partners. Three are here joining us today. So now I'd like to ask each of the panellists to provide a bit more of an outline as to why grey fleet is a concern or relevant to them. Rachel? Thanks, Darren. So Rachel Gunn from the Commonwealth Bank. At the Bank the health and safety of our people is important to us regardless of the activity. So when work driving was identified as a key risk we needed to ensure that we had all the systems and processes in place to ensure the safety of our people regardless of whether it was driving a business case motor vehicle, which is the tool of the trade vehicle, or having been identified as using a personal vehicle for work purposes through the mileage claim or expense claim process. Our strategy also extends to the community. So ensuring these programs are in place, we also then ensure that the people, the community are safer on the roads. We aim at the Bank to ensure that our people go home from work in the same condition that they came. So making sure we support them in that activity is key for us. Hi, everybody. Richard Schuster, I look after fleet and procurement at Churches of Christ in Queensland. Churches of Christ in Queensland is a large not-for-profit, it's one of the largest - in the top 10 - in Australia. It has a very large fleet, about 630 vehicles, and a very diverse operation that covers a lot of areas. We do probably about nearly 11 million kilometres a year, about 14 times to the moon and back, and that's a lot of exposure. So grey fleet and fleet issues are very important to us, particularly since caring for the community is the real reason why our not-for-profit exists. So we just need our caring staff to be very caring on our roads. Thanks. So Lonnie Toia, National Health and Safety Manager for Sanofi. We are a pharmaceutical company. We sell vitamins, mineral supplements, pharmaceutical drugs. We're there to save lives, and so for us the idea of having an employee pass away as a result of driving is just not within our scope of thought. And so for us it forms a critical part of our business. So to have a program that protects our workers in their car regardless of whether it's our car or their car is fundamental to our business. I'm a former legal practitioner who had a personal injury practice and particularly motor vehicle accident injury practice, and for many years I've been a legal academic teaching tort law, so looking at civil liability for organisations. I also work in researching in other areas around transport, and so I'm particularly interested in bringing all of these issues together. Workplace Health and Safety Queensland is one of the seven regulators that form HWSA. So if we start at that level, there's a national strategy to try to improve health and safety outcomes. Obviously work-related driving is one of those key activities that cause injury. So we're looking at opportunities before the end of the strategy in 2022 to get further traction on improving risk and those outcomes, and this is one of the areas we can work in. Great. Thank you. So I'd now like to ask Tania to provide some insights regarding legal perspectives. Why it matters? What have you found in your research? And should organisations actually care about grey fleet? Well, before I start, I just want to make it very clear that I'm not giving any specific legal advice; that my comments are in the nature of just a general discussion. So there are a number of legal implications that can arise in the context of thinking about grey fleet. It's not a term that's included in any Australian legislation or in case law, but it might arise in relation to work health and safety issues - the vehicle is a workplace - workers compensation issues, particularly in the context of employment related journeys; motor vehicle accident claims and CTP schemes and whether they apply or not and how they might intersect with workers' compensation schemes; licensing for drivers, and do organisations know what license or license conditions apply to their drivers; criminal and civil liability, potentially; and of course, the heavy vehicle national law chain of responsibility. And there are increasingly emerging issues around the collection of data, privacy and who can access that data and for what purposes. Great. Okay. So let us consider now where fatalities and serious injuries are occurring in the workplace. We've got some information, you know, 76 workers, or 42% in 2016 died as a result of vehicle collisions. The next sort of mechanism of injury in terms of fatalities in the workplace was 25 workers, or 14%, dying from falling from height. So there's a big difference in terms of the statistics of how many people die with regards to motor vehicles and crashes. Shane, what are your thoughts from a regulator perspective on those sort of statistics? Sure. Darren, when looking at those figures, the first thing I'd say is they're all industry figures. So if we think about the spread of those fatalities across, in, different industries, falls from heights generally occur within construction or related industries. Those vehicle collisions happen across all industries, but there would be a cluster also around road transport or in the transport industry. If we look at the regulators, we're structured around the priority industries, and of course, construction and transport are two of the priority industries. So we'd be doing a lot of work in that space. The other thing I'd say here is that it depends on whether or not all the injuries are being notified to the regulator and that then they are actually investigated as a result of that. Enforcement happens either through proactive campaigns where we focus on the mechanisms of injury, and we'll be doing a lot of work there and that would flow out of that, as well as those ones that are notified, where we can actually take action because we know there's an issue. So given that the vehicle is a workplace, and that includes light vehicles, and as you've sort of highlighted there's an obligation to report an incident, but potentially that's not occurring. So what, in terms of a regulator, are you doing in the future to start making that happen so that we can address those issues? Well, I'd actually say we're doing things now. So one of the key drivers for us is working with Austroads around the vehicle as a workplace guide. That guide will provide some specific practical information to organisations about the notification requirement, about what they must do in this space when people are at risk of injury or death because they're driving for work-related purposes. We've always had the provisions in the general sense, but this makes it specific to organisations that they need to do something. The guide is about to be endorsed, we will then be able to communicate that more specifically across industries. The second thing we're doing is there's a couple of working groups through HWSA to actually target particular areas of concern, responding on road fatalities. This is one of those areas where, across the jurisdictions, what we will be doing is actually pooling resources and sharing information to come up with a more, I guess, consistent approach. Can I make a comment there, Darren, that I think it is important right at the beginning to acknowledge that all of the jurisdictions in Australia potentially have different legislative provisions, and so it's important for us to remember here, but before we go further in our discussion, that we're dealing with a patchwork of regulation and that what's happening in Queensland might be different to what's happening in South Australia or New South Wales. And so we need to bear that in mind. I'll ask the panellists around the table, given that the regulators’ highlighted and Tania's highlighted, the legislation: the vehicle’s a workplace and incidents that occur in a workplace, and in this case it's fatalities in a vehicle that's used for work, the panellists around the table, are you aware that you are meant to report that? It's a reportable incident, like any other incident, like falling off ladders, etcetera. So what happens in that space? I suppose that for me, it's not something that we'd really considered before. We've been talking about this this morning before we started and that understanding of that we've met threshold for that, it's not something that we would recognise, it's a vehicle accident and separating that workplace and home life type of perspective. And absolutely, it's a workplace. We recognise that, we control that. But to report on that is not something that we would probably consider. Having said that, we probably haven't met the threshold for a lot of that, and so that's another factor. So typically in the industrial sense we know, someone's gone to a hospital, we know they're getting stitches, we know they're going to be an inpatient, that's a fairly clear and cut decision we're reporting straight away. Or even we probably over-report in many cases. We report early because we want to be seen doing the right thing. We also want control of the incident investigation, and there’s whole other processes around management of safety, but in that vehicle sense, we have lost - we lose that control because it's in the hands of the police or other authorities, and it's not right there. So, reporting, I probably would say that we haven't considered it. And further to that, educating our people that even though they're in their personal vehicle, they're still doing activities for work purposes, therefore it falls in the reporting process, they don't just think, "Well, it's my car, and I was going to a meeting, so I'm not going to worry about reporting that." So it's ensuring that we get the education out there, that what they are doing under the direction of the organisation whilst in their personal equipment is still at work or a workplace. Yep. Certainly, for us, if there was a client or a resident in that vehicle, there are very clear reporting requirements for us with government funding for our provisional services, we do need to report those. But general ones that Lonnie was referring to, they wouldn't be reported on the vehicle side. Yeah. Okay. So to each of the industry panellists, and also then, and you've sort of part-answered it, but how does your organisation approach safety? And how does that then relate to the grey fleet? Transferring across? Richard? Safety is very important for Churches of Christ in Queensland, and we would like to think that grey fleet and the standard fleet are treated the same, but there is a differential treatment in the two. It's not called grey fleet, for, without reason. Getting exposure, getting people to recognise that it's important for safety as well, just as important, that is an avenue that we're working on. So we are working very hard. To put it bluntly, we don't have a great track record in the driving safety side. We had a large number of infringements and quite a large number of crashes last year. We're working actively to improve that driving safety culture. We're doing all of the low-hanging fruit things, like we are buying cars that are as safe as we can buy. That part is easy. A good fleet manager will do that. But it's that driver behaviour that accounts for 94% of crashes. That's where we're investing our time to really educate our drivers. And we'll explore as we go on how difficult that is in a grey fleet driver sense. But as an organisation very focused on safety, rolling that down into the grey fleet area is the challenge, getting that seen and getting that covered. Yeah. So as some time ago when driving was identified as one of our key risks in our risk portfolio, we took a closer look at the policy, and it was very quickly identified that there was policy in place for the business case motor vehicle and tool of the trade, but not a lot, if anything, that extended out to the grey fleet. So our approach to that was to get an external agency and to have a look at us and do a critical risk review. That was approximately 18 months ago. From that came 59 actions. We took all of those actions and put them into place. We then formed an end-to-end work driving program, which 18 months later, we had Dr Darren Wishart come in and do a ... we asked you to program to review. So Darren did an end-to-end work driving program. Of that we have new activities that we need to work to. The aim for us, which I find slightly challenging, is to identify the legislative requirements, then work to what the corporate expectations are around the advice, but then in addition to that, providing a program that our people can apply. So having, at the moment, as it stands, having a very hard, fast ANCAP five-star rated regular servicing, maintenance, routine inspection in place isn't going to be easily transferred then onto our grey fleet. And as a conversation I had with Darren yesterday, then, in addition to that, when and if case law happens, what the law sees is reasonable for the business to do. So we'll continue to have reviews, work with industry peers, work with the National Road Safety Partnership Program to look at what's out there. And another key factor is speaking to the people. What is reasonable for them? How do they perceive what we think’s ok, and how can then they apply it? So it's a consultation with a whole range of people and listening to either, one, engineer it out, the risk, or build it into processes that people don't even know that they're acting in a safe manner, it's just part of your day. Darren, can I just note that our three industry representatives here all come from large entities, and those large entities will have good structures in place around identifying risk, managing risk, developing policies. I think the issue around grey fleet is that many of these vehicles and the use of these vehicles is in industries or organisations that are small to medium enterprises, and often at the very small end, where there aren't clear risk management structures, where there aren't clear policies, where there might just be a couple of people involved, your pizza-delivery people late at night, and those raise very interesting issues as well. So it's great that the top end of town is really starting to engage with this, but there's a much bigger tale where these issues I don't think are even on the table yet. Yeah, Tania, you're absolutely correct. I presented at a conference earlier this year, an aged care conference, and, on grey fleet, I should say, and at that conference the number of people who came up to me afterwards, because not all aged care facilities are big. You know, it may have had, be, one community-run facility and just a few cars in that one. And they came up, and they said, "I've never heard of grey fleet." And on the second day of the conference after I presented, a number of them came and said, "I actually didn't sleep very well last night. Thank you for making me aware of that." So that is a good point. And of course, not only employees, but volunteers for not-for-profit organisations as well, would be collected in this space. Yeah. There's actually another tier that scares me as well, and that's, we have the private use of a staff member's vehicle. We then layer that to moving, taking somebody, a client or a resident in that staff member's vehicle, and then the next layer where our staff member drives a client's vehicle. Which we do on a number of occasions, and we have process around that, but you talked about where you can put control, and we have controls, we're working on safety for our fleet drivers, and we can ask them to do an online driver course, we can make that happen. What do you do with that person who's driving their own vehicle for work purposes? How do you make them do that? There’s that moving or crossing that divide is proving challenging for us. There's a big challenge there, the difference between what we refer to as the traditional fleet and Rachel, you mentioned before about, in a traditional fleet, you've got company policies, you can have a five-star supplied ANCAP rated vehicle, and then Richard, in your case there, you've got people using private - their own vehicles or a client's vehicle. I'm guessing you can't determine that that's necessarily a five-star ANCAP rated vehicle or, how do we go with that? I can guarantee that it's not. In fact, we did a grey fleet trial just recently in partnership with NRSPP and University of Melbourne, and we put telematics devices in grey fleet vehicles, and I believe it's a ground-breaking one, that the Melbourne Union, NRSPP are saying. It highlighted to us some key concerns about grey fleet. One, a lot of the cars were too old to put the telematics device in. They are more than 10 years old. We didn't expect that. Luckily we got 43 out of 50 people doing that, and what we did find as a result of that was our cars were significantly, grey fleet vehicles were significantly older. Those vehicles also travelled significantly more than other vehicles in the trial. So our people were using the cars a lot more. And we got a driver score. Everything was anonymous, we don't know which driver A from B, that for the 10,000 plus drivers and 100 million kilometres that were actually assessed and what we are benchmarked against, their driving school was about 68%, and we were about 64%. So we can see straight away that we're not quite at the average for drivers. So we're driving further, we're not quite as good, and we're driving older cars. So straight away there's a concern for grey fleet. Can I pick up on that, just in terms of the use of telematics because obviously when we're focusing in the road transport industry, it's almost become the culture then, that's what we do. And through that they've being able to manage risk better by providing that feedback loop to drivers about the speeds that they drive at, the way that they drive, are there heavy braking forces, things like that, which again, can be used to shape driver behaviour. So it seems to me that it's a good opportunity in terms of being able to think about that fluid grey fleet, how we're going to improve the health and safety standards going forward. If that makes sense. The use of telematics though raises really interesting privacy questions when we're thinking about the use of grey fleet. Should we be tracking where someone goes in their private car? Who has access to that data? How secure is that data? What else can that data be used for? And do the grey fleet drivers know the extent of the data that's being collected about their travel habits or their driving habits? Which starts at the beginning. Yes. Out of 50, I did note, that 43 did the trial. So seven people. Several didn't put it in, and several then pulled it out. But we were pretty happy actually with 43 out of 50 for the trial. Did you do a check on how often they'd maintained their car or whether the services were full services or when they last checked their tire pressure? Not for the purposes of that study. And so those are all extra things on thinking about the safety of those vehicles. Yeah. What does concern me with that age one is, I think, I read 21% of the fleet, Australia's national fleet is more than 16 years old. So a fifth is more than 16 years old out there. They're going to end up in your grey fleet if you don't have a policy or you don't have something that tries to prevent that from happening. In the not-for-profit sense, it's again, hard because we want our volunteers. We have 1,500 volunteers in our organisation. Getting volunteers is harder and harder, and in telling a volunteer, "Well, your car doesn't meet our standard. You can't use it." Do we then reduce the gene pool of volunteers? So what I find in the not-for-profit sense is a competing tension between the resources, and we want people to use their car to help us out, but on the other end, we're putting restrictions around it, for a very good reason, I understand. So there's a hard act to follow of balancing that obligation for the whole driving safety component. But how do you tell a volunteer that there's problems because you'll just lose volunteers. That has huge implications for a not-for-profit. For drivers, you can mandate. For the volunteers, it's, they just don't turn up. I think, the reality for everyone though, is that we're all competing for people, and the more restrictions we put on our motor vehicle policy, the less we have people wanting to come and join our business. So for us, in that, what's the best way to put it, the fight for the best labour, we really try and have a whole and encompassing process that really achieves that better. And certainly, in terms of the volunteer space, that would be a great difficulty, but for us, we're on the other end of the spectrum, saying, "Well, how diverse can we make our fleet, but also making it safe to be able to attract more people?" So whether we're trying to retain them at your end or retain them at our end, it still is that competing against other employers and saying, "Well, how open and liberal are you with your motor vehicle policy?" I think for us the ANCAP rating is an absolute must. We even go into the factors to the level of seven years maximum time period for your vehicle because what was seven years ago standard, very, very different to what is a standard ANCAP rating now. We're even looking and saying, "Well, where's that going in two year’s time with ANCAP ratings?" Lane-keeping assist, and other, automatic braking, all these other features are saying, "Well, do we bring that into that policy and say, in two year’s time, that's going to be mandatory for all new vehicles?" And that's not just for our own fleet vehicles, but it's equally for the grey fleet vehicles. So being a big business, we're quite fortunate to be able to stipulate just exactly what cars we can have and accept underneath that grey fleet policy. So we are in a bit more fortunate situation for our business. Even in an organisation without the volunteer side, there's this move away from owned fleet to packaging and providing, novating, providing a car allowance, because then you just reduce your fleet, the problem goes away. No, it doesn't. So there's another competing tension. Let's move the fleet out. We don't need to worry about it then, it's not on our books, just give them a car allowance and we're covered. But unfortunately, no. As we're well aware, we can't do that. That just shifts the responsibility. Responsibility stays there, but the fleet's just moved. Which goes to the design of work. You're redesigning work in a way that meets the requirements of the organisation, I guess, financially, profitability, et cetera. But you can't design out the obligation. The obligation extends. And I think Tania's work about what are the common things that all organisations, not just the larger ones represented here should be focusing on to try and manage this risk, just to make sure that we're talking to all the organisations who might use grey fleet, not just larger ones. And this discussion around the nature of the vehicles also raises for me issues around equity, particularly in an era where those at the other end are often working in very low paid jobs, required to use their vehicles to access their work or to travel between different work sites and requiring those workers to have vehicles that meet particular safety benchmarks might put them out of the market altogether because the income that they're earning means that they have to make financial decisions about where they spend their money, they buy a cheap car, they buy an old car, they're using their car because they have to, they don't have access to a leasing program through their employment, they might be casually employed, they might be piecework employed. And so they are using their vehicle for work. There's no control over that. They can't afford to have a good vehicle, a safe vehicle, and no one's checking up on whether they've even maintained that vehicle properly or not. And if we do check-up, enforcing something that they can't meet. So it's finding that balance of what we expect and need and what they are able to comply with or do. Yeah, it's tough. And so from a regulatory perspective, if we've got these challenges and as Richard's identified, organisations are probably moving towards more of the grey fleet compared to the traditional fleet, we certainly need to be careful because those statistics of fatalities in a work vehicle could potentially go up if we don't have the same management capacity in that way. And what does this mean too as we see the rise of the gig economy where people are going from piecework to piecework to piecework using their vehicle to facilitate all of that, what is the organisation there. Is that the Air Tasker, or is it the, what other platform that's providing those jobs? And so the whole nature when you're talking about the future of work, this really is going to be an issue going forward. Lonnie, you mentioned earlier that ... it sounded like you were trying to in your organisation get a bit more synergy between some of the things that you do in your traditional fleet and applying that to the grey fleet. And you mentioned the vehicle and the age of the vehicle. So over the last couple of years, what sort of things have you tried to achieve in that grey fleet space? Yeah. So I've been doing safety for 20 years, and I've only been doing road safety for the last four. And I've been quite fortunate that I've come into it later in life. So we look at exactly the same things as we would for normal business. Okay, so, do we have the right equipment? So vehicles, and that's where we have that motor vehicle policy, ANCAP rating, we then have other environmental pieces there as well and fuel efficiency metrics. Do we have the right system? Are we training our people the right way? Have they the right skills? Do they have a valid driver's license? It's amazing when you do the checks just how many people have either expired. We recently had a gentleman who moved from one state to another, wasn't aware that he had a certain time period to change over his license, and we got on to it really quickly, and we stopped him driving straight away and made sure that he got his license attended to. And they're simple checks that everyday mistakes, but in the work context that just wouldn't be deemed acceptable. So we have those systems' approach in place as well, but then we also look at that vehicle maintenance piece is absolutely key. So regardless of whether it's grey fleet or whether it's our standard fleet, we really make sure that, are they inspecting their vehicle every month? We provide them with allowance for grey fleet, for basically all the regular drivers in grey fleet. I'm not talking about the mileage allowance people. We provide them with an allowance that's suitable enough to maintain their vehicles. So they may have the excuse that, can I afford the four tires this month? Well, if they've managed their finances well, we've paid them the allowance for that. They should have that available and ready to go. They may choose to novate it, that makes it much easier, easier options for maintenance, but they may choose to just do the, have used the cash they would for their normal vehicle. But we have really strict controls around that, saying, "Here's your car. Have you inspected it? Have you maintained it?" The inspection piece then also plays on the behaviour side. So I liken it to, a salesperson will go to the customer to keep the product front of mind. For me that inspection program is just exactly the same. We're putting a safety element in front of mind for the driver to regularly engage in that process. They’ve got to physically do something with their hands, with their mind, within road safety, and I would hope that that translates across to their driving behaviour. So Lonnie, that's written in your policy? You've got grey fleet embedded in the company and grey fleet policy? We make no difference between the two in terms of our expectations, for maintenance inspections, driver behaviour, driver licensing. And then we have a separate piece on driver safety, and that mandates our piece around training. So every five years they've got to do a practical course, and every six month they've got to do an online module to help keep their skills, knowledge and more importantly, their awareness, so hopefully with their time behind the wheel they can purchase their own safety by driving safely. So it is, it's taking that management systems approach that I’ve used for 20 years within health and safety, bring it across to fleet and say, "Okay, what kind of work?" It's certainly driven down injury rates, certainly driven down fatality rates across broader business and absolutely, we're starting to see those vehicle accident rates come down, particularly the at-fault vehicle accident rates. Rachel, in terms of grey fleet in the last couple years, where have you progressed? So we implemented the program, an actual end-to-end work driving program. There's still a lot of work to do in the area. Just to give you an idea of size, so we have 38,000 people domestically. Two thousand have been identified as having a business case motor vehicle, and then in addition to that another 2,000 have been identified as driving grey fleet. So at the moment we make sure that, the same as Sanofi, we’re making sure that people are trained and licensed, making sure that the training is appropriate. We run an annual drive attestation program. With relation to the company cars, they're always issued and set at a minimum standard, which is the ANCAP five, etcetera, but for us at the moment it's just getting that understanding of extending it, it sounds like you've got it, yeah, extending it to grey fleet, we're finding that happy balance to having something that the staff can use and apply. Excellent. Richard? In the last couple years? I think my job here might be to encourage those who aren't as far advanced. We're on the journey, and we are at the stage, we're past awareness that the idea of risk and this needing attention is recognised by our senior management and our CEO down have got behind this. So I think that's important. What we've had to do is get a handle on how many kilometres our vehicles were doing, and we've got, we’re sitting at about 630,000 at the moment, that we know grey fleet kilometres. Sadly, that's a about a 38% increase on last year. Now you think, "You're not doing a very good job of reducing your grey fleet." Well, one, you don't have to reduce it, you have to manage it. Two, the nature of our organisation, particularly community care, is growing. Community, as community care business grows, a lot of the kilometres, the private kilometres are being done in community care, and so that's sort of a focus for us. And it'll probably be nearly 90% of our grey fleet kilometres. They're the ones we know about. We probably don't know about that other 2,000, but we're working on that. So now that we have that support and that awareness of how much exposure we have to the grey fleet, we're rolling out those initiatives similar to what both Lonnie and Rachel, you have done already. What I expect to have seen happen in a fleet area, in our fleet vehicles, hopefully will transition to the grey fleet ones as well. On a volunteer fleet we won't be able to be as prescriptive as you have. I'm not sure how we would mandate them to do an online course, so that's going to be a challenge. Sorry, it's an interesting piece. We've got a broader road safety commitment within our business now because we recognised it, and in Australia and New Zealand, we spend so much time out on our roads. Such a beautiful country. We drive for our holidays, typically. So we're actually starting to think even more broadly and offer online training for our non-driving staff because that's going to provide that next step to capture those that aren't necessarily caught with our standard programs that only drive a really small amount, but it also helps with our culture, particularly when it's being led from our senior managers who want this to come in, supporting it to come in, to help change that mindset of, it's just about work. Well, it's not. We need our people to turn up to work every day, whether it's work related. We need our volunteers to turn up, in your case, to turn up to help with your services that you provide because without them we fall apart. So there is trying to change that mindset of, it's just about work. We’re now starting to think that little bit, next step further, and maybe that's another opportunity to say, well, how do we that? We then just don't offer to drivers, we offer it to everyone. Of course there's a dollar cost too that comes with that and how do we manage that. Yeah. Darren, one thing that we have managed is to augment our fleet management system to incorporate the grey fleet vehicles. So it's going to be a tiered, a two-level approach. We won't capture all of the data that we have for our fleet vehicles for the grey fleet vehicles, what we will capture is that they're registered, that they’ve been serviced, their insurance, and those will be loaded on, and the system will prompt us to make sure that those are current and to chase those up. So that, getting us, systematising it, is a key step for us, we're just about to release that module in our fleet system there. Okay. Yeah. Certainly, in talking with people about grey fleet, and certainly talking with the insurance sector, there's an area that's a little bit concerned about grey fleet in that oftentimes people will use their private vehicles for the work, which is their grey fleet and the insurance box is, you know, tick it, whether it's used for work or whether it's not, and there's a different cost involved in either insurance policy. So potentially some people just tick it's a private vehicle, and then maybe down the track it's discovered it's not. It has probably some serious implications. Can I just speak to that? I think a lot of workers who are using their vehicle for what technically would be a work purpose don't regard that as being work purpose. So they're just dropping off the mail on the way home, or they're going to the bank, or they're making a delivery to a client on the way to something else, or they're in a car having a work conversation on their mobile phone. So when does the work journey become a work journey? Indeed. Indeed. And of course there is a different legislative framework in every jurisdiction across Australia. And so just because something is regarded as a work related journey in one place, doesn't necessarily mean that it will be in another. Then the addition to that is the insurance companies themselves, you can have a sales rep and it's commercial use for one company, you go to another company and that same sales rep activity is not considered commercial use, and you go “Well…”, and you try to... If we're, as a business, saying, "Oh, we need you to have it for commercial use." And then if the insurance company says you don't need it, our employees get confused. And that's for a tightly controlled business like ours. Again, I do feel for the other organisations that don't have that level of control over that. So there' a lot of challenges involved in the managing of the safety of grey fleet. I'd like to pose a scenario to you now. What about this case where you've got a grey fleet, a worker's vehicle, and it's involved in a crash, and the airbag deploys, but as we know, in recent times, there's been a Takata airbag recall. And you find that the organisation and the driver haven't done a lot about it, it's a grey fleet vehicle, how do you enforce the driver to replace the airbag, has it been done, have you checked it. But what you find is that the people in the vehicle have been injured as a result of a Takata airbag in a grey fleet vehicle. What does that mean for the worker, the vehicle, the legal implications' potential? It hasn't been conveyed yet, but Tania, I'd like to throw it to you as a first point. What were your thoughts on that? Look, it's a really, really tricky question because there are so many variables there. So was there some sort of workplace policy that managed grey fleet or was there not? What sort of journey was this? Is this a journey that would come within the workers' compensation legislation, so it might be covered in that context? Is it something that the employer or the organisation should have known about? Did they have sufficient control to know about that vehicle? Are we talking about injury just to the people in the vehicle because of the way that the airbag deployed, or are we talking about injury to people outside of the vehicle, so does it come within the CTP scheme, or is there a conflict between workers' compensation eligibility and CTP eligibility? For me, this creates opportunities for creative lawyers to think, "Well, if we can't get this as a workers' compensation matter, if we can't make a report under Work, Health and Safety, if we can't access CTP claims, how else are we going to deal with this?" And I think then for me, questions around what's reasonable for the entity to know become really important. What could they foresee? And I'm talking more in a common law space here. How are they expected to foresee that? What information might they have imputed to them by the law that would allow them to foresee particular risks? And then how do they manage those risks if they've really got very little control over them? So if we're talking about a worker's vehicle or a volunteer's vehicle or someone who comes within that very broad definition of worker for the Work, Health and Safety Act’s purposes, who has a vehicle, who may or may not have made particular financial decisions about how they respond to that vehicle, or a vehicle who could not take the vehicle back to the dealership to get the airbag changed because they had certain pressing personal circumstances, how does all that fit into the mix? So I think there are just so many elements when we think about something like that. Are we expecting that every organisation will keep a regular check on vehicle recalls? So there was a vehicle recall that I was aware of just on the news last night. Now, does every organisation have a means for checking every vehicle recall that's been issued? Well, hopefully, hopefully. Hopefully they do. Well, for their fleet vehicles, absolutely. But if we're talking about older vehicles, if we're talking about private vehicles, are they keeping up to date with the recalls, are they then asking all their employees or workers or volunteers, "Do you drive one of these vehicles? Have you done this?" If we're expecting you to be able to use your vehicle for work, are we going to give you another vehicle so that you can send your vehicle off to get the recall work that's necessary done? I mean, all sorts of questions. Well, it goes to the system of work, I think, what you're saying. What is the extent of grey fleet to the ordinary fleet within the organisation? Have you done, taken action around recall for that ordinary fleet? Wouldn't you, as a matter of course, be engaging those who are driving grey fleet in that same information? How often are they driving? Is it just a one-off in this case, or is it part of that ongoing regular requirement? So those are the matters that we would be considering, whether or not we were notified of it or not because often we get contacted by organisations post-event to go look at the issue, of course, because it does support a common law claim. So there are other, these are the types of things that, I guess, as a regulator I would be asking or experiencing in trying to get some clarity in that circumstance. And how do you overcome the public lethargy about taking their car in to get it fixed when they get a letter that says, "This could kill. You need to take this in and get it done." And the dealerships are having trouble getting the people to take those cars in. That worries me. So what do you do to the industry here? What are you doing - you know, that's been an incident that's been highlighted. What process is it, you know, are you educating? Are you just continuously conveying to your grey fleet people that, are they aware of this Takata airbag issue as an example, or any other recall? You've got processes in place if that's occurred? For our standard fleet vehicles, yes. For our grey fleet vehicles, we are wholly and solely reliant on the fact that we asked for records of when they got their last maintenance done. But my sales reps are probably now wincing that I've created a new question for the vehicle inspection around vehicles and Takata airbags. Exactly, the same as Lonnie here. Fleet vehicles, we are all over those like green on grass. They are covered. But the others, no. We rely on them to be doing their service and hopefully overcoming that lethargic, "I don't care about this recall issue." One other concern that I do have is fittings generally for vehicles. So going beyond the Takata one, what about the cargo barriers? So someone has a four wheel drive or a large SUV and they want to use that for work purposes, but have that packaged, all of our cars have a cargo barrier in them, where required, what about the grey fleet vehicle? It should have, and if it is a packaged novated lease one, then generally it would, but what about the person who's using their car on an ad-hoc basis, loads it heavily in the back because they're driving out to St. George to visit a facility and everybody asks everybody in our organisation to take things out to somewhere, what if they don't have those fittings? That's a concern, yeah. Let’s go to the broader usability of the vehicle: Is it fit for the purpose you're asking people to do? So it's about the barriers, I understand why you have them in your industry, but it might also be about manual tasks and what you're asking people to carry and whether or not it's actually designed for that purpose. So there's some broader issues around fit for purpose. If you're going to ask people to use their own vehicle, you got to make sure that it actually can safely undertake the work activity. Well, again, some of this discussion is highlighting it for myself representing the regulators as to what we can do going forward. I think the key message is about the vehicle is the workplace, not just in industry, in transport, it's across all industries. If that's a mandated or a required aspect of the role, then you have an obligation, that obligation looks like this. I think some of Tania's work informs that. Indeed the way our legislation works is that it doesn't have to be a regulation or a code of practice, it's available guidance, which goes back to reasonably practicable. Now, this is available guidance that an officer of the organisation through due diligence ought to know. And so we can push at that level because they're, I guess, personally exposed if something goes wrong, and I think we need to be clear about that. They're liable at all for any failure of the system. So I think we're getting those messages out there, and there’s some strong messages. the effect, the new braking systems or cruise control properly or those types of things? Yeah, so we're currently looking at that as part of the review that we had done by Darren. It was, one, is the equipment appropriate, and two, do they know how to use it. So our, we have an annual program called The Work Driver Attestation Program, and it extends to grey fleet. So drivers must annually attest that they have a driver's license, and that they are legally able to drive. Throughout that process they also have to do the training, and in the package there's also a work driving guideline, which then extends to, so even though we don't enforce it necessarily for grey fleet, but it also extends what we do for business case motor vehicles to grey fleet in relation to the expectation, not the demand, but the expectation around servicing, maintenance, the safety of your vehicle, whether it's a recall, whatever it is. So the awareness of the expectation is there, it's missing the actual formal process for it. But it's a very good point. You get a brand new car, next minute it's parking and braking for you. And it causes an issue. So it's on the job list. And as Richard mentioned before, the data says that over 90%%, 93% even and more of collisions are caused by human error. And so, organisations can pay huge amounts of attention to the mechanics of the vehicle, but continuing to ensure that people are up to date with the most recent features on those vehicles and how to use them effectively can be very, very challenging. I think most of us who go out and buy a late-model vehicle don't ever think, "Oh, I'm going to have to update my driving skills now so that I can really use these safety features to get the most benefit out of them." We don't think that, we just assume we have a valid license, we can get into whatever vehicle we'll buy and we'll be able to operate it safely, but in fact, some of these new features would benefit from driver education. So that's just another thing to throw into the mix. I'd like to respond to that because I think it’s, again, human error is generally a systems fault that leads to someone behaving unsafely or making the wrong decision. It could well be if they have the training, the information, the instruction, so that covers that point, but there's so much in car connectivity coming in the next 10 years, the potential for driver distraction is such that what our organisation is doing to make sure that drivers know how they're supposed to interact with their Facebook, their email, other things that they can do just by voice activation or some other means. So it's not only what we've got today, it's what's coming, and I think it's going to speed up in terms of what organisations will be needing to do in terms of building their systems to respond to those issues. Absolutely. On that technology side we've had some staff say, "How do I turn it off?" Because if there's a lane departure that gives me a noise, and I don't want that noise. So could I turn it off. Which comes back to systems, and the system, the system at work should not allow you to turn off a key safety feature like that. We did actually have someone also ask, "Where's the CD player in my car?" So the technology is going the other way for them. They wanted their old school – and it’s like, no, we don’t have that. But does your policy include a requirement that people don't answer work calls while they're driving? Given the data that, that Shane and I were talking about before we came into this webinar about the levels of distraction on drivers and causing accidents. And so that's a really interesting workplace scenario. If you know that you're going to have a worker in a vehicle traveling from point A to point B to get from one campus to another, from one office to another and there are calls made to that worker about important material that they need to know before they get to the next meeting, should they be able to take that call? Yeah, there’ll be a record of that call. So we've had the conversation around no mobile phone use whilst in vehicles, just a general discussion. And it’s like, “But this is my workplace. I get in my car at 7:00-8:00 AM, I make my calls, I do my work, I get to my meeting, I leave my meeting, I answer my six messages whilst I'm driving, right?” So the expectation on them for us to impose that isn't reasonable. However, what we would like to do through education and training is to teach about driver behaviours, response time, distractions, which I went through with Darren when we did the audit, to make them aware to make their own educated decisions around the risk that they're putting themselves in and then potentially the community if they choose to answer that call. Or can it wait? So we can't mandate it, I don't think it would ever really get across the line, but we can take reasonable action to educate and train to make my own decision. I now because of this program put my phone into car mode. If it's ringing, it will agitate me and I'll want to answer it. If I don't know it's ringing, then when I get out, I have a look at it. So I make those choices through education. So I think it's the best approach through awareness and change the behaviour without mandating because people don't like to be told what to do. They need to come to that decision on their own. There's a lot of challenges. So, and you've highlighted today a lot of these challenges, and it's evident from our discussion today that there's a lot of people within your organisation and probably outside your organisation, a lot of stakeholders that kind of need to come into this. It's not just your problem, it's not just your problem, it's not just your problem, you know. So how have you engaged, Richard, how have you engaged other stakeholders within or without your organisation, outside or inside of your organisation, to get leadership on board to support these challenges and addressing the challenges in grey fleet? It's a good question. I think one of the key elements for us has been providing the data. Knowing that we have a large number of claims for staff reimbursement for kilometres indicating that there is large usage of private vehicles. When on a pure cost side you can present that to senior management, park risk, risk is vitally important, but just go, if you need to convince a stakeholder, say, "Look at what is being paid. Look at the dollars being paid here." As well as highlighting the key risk elements. And I'm glad to say that our CEO and senior management team are fully on board to support this because it won't work and it won't continue without them. I do wonder if one of our key stakeholders though is not the driver of the private vehicle. We think, our senior management team, they are a key stakeholder. It's how we convince them to adhere to the safety elements, I think, that is important and that's one we're going to be wrestling with over coming months. It's how do you get them to be signing up to participate in a safety, an online safety module, if that's one of things we want to do? Simply to do the pre-start safety check. I mean, getting our staff to do that with their fleet vehicles as always a challenge. And we know it's important. I mean, and you can always go back and say, "Well, the manufacturer's handbook says you need to do a safety check. So here it is, the handbook for the car says do a safety check, so we really need you to do that safety check." But I think we need to engage that stakeholder as one of the key ones. Okay. Rachel, how have you engaged the stakeholders? So throughout the whole process we've engaged a couple of external agencies. We work closely with fleet because fleet actually managed the business case motor vehicles, look at how they're approaching it, and then get it into our policies which is through our workplace relations. We've also engaged with group insurance because they see the cost to the business, and then also the people. So as I've said three or four times today, we need to get that buy-in at the endpoint, what works for them, because if it doesn't work, they're not going to apply it, and having that approach of it's just part of your day. Yeah. So several touch points throughout the whole process for different views. Yeah. Certainly for us a lot of the key stakeholders are on board now. So if I look from our senior managers and middle managers and for our drivers, I'd like to think that we're there. That's not to say that we don't have to continue because we can easily lose them. It's like any cultural piece, you can get people on board, and they can easily drop off. So it is an ongoing piece that we have to continue with. Our next steps really are to engage our broader community, our broader staff members because that's how the culture is going to be sustained. So it is not just about the work trip, it is also about your family holiday, driving to and from work, driving the kids to soccer on the weekend, so that we can live life to the full. I'd like to now, just in closing, go around the table. Shane, in closing, what are the next steps to make grey fleet much safer? Yeah. Well, what I'm hearing at least at the workplace level, it's an interest-based approach, it's about what are the benefits both to the workers and to the organisation, whether it be dollars, health and safety, holidays, etcetera, being safe in that way. So building a culture at the workplace level. For the regulator, perhaps, for us, it's those messages before about us stepping back and looking at this issue nationally, as I've pointed out, we'll be doing that throughout some processes, to see what more we can do once we have the guide indoor. So we can use that as a platform to communicate practical information, targeted information. I think in the middle there it's a supply chain issue. It's between organisations, or your internal organisation of supplying labour, if you like, to make sure that everyone's on the page as to why it's an important issue. So there's three ways that we can actually affect change. I think our next steps are going down a level in our organisation. As I said we have senior level support, senior management support, and as we move there from middle management to service managers and team leaders and getting them to engage, particularly in our community care side, activating all of the processes that we have in place for the grey fleet because it's fine to have it happen, as we've said, the policy can stand there, but we need to have people following that. So I think as that moves down the organisation that will be key. Getting our fleet system fully up and running to integrate and allow us to report on it is another key one for us. I'm not unconvinced that there's not an opportunity for positive incentivizing for, say, particularly our grey, our volunteers. So we're asking them to do a lot. They are volunteers. And this goes not just for volunteers, but for non, say, allowance, car allowance provider people. Why is the expectation fully on them to, okay, we want you to get this higher level of insurance to do these things. Surely there should be some recompense, some level of positive reinforcement for them. So I don't have the silver bullet for that yet, but that's certainly one of the next steps we want to look at. Yeah. Rachel, what would be your next steps? So we're very lucky. We're 100% supported by the board and the executive leadership team. So the next steps are to finalise the work driving standard, regardless of whether it's in a company car or not, get that process in place. Further to that, educate our people on the expectations in relation to that. And Lonnie, we're the same as you, we extend to families, as well as out to the community because, what, 99% of people will be in a car or drive a car at some point, so if we can have that holistic approach to safety whilst driving is one of the messages that we'd like to get across. So we need the sound guideline which then will facilitate and guide the actual activity. It's behaviour. You can have the policy, but the paper is of absolutely no use to you when things get wrong. We need the human element of understanding and acceptance, and the trick is getting that message that, and really believe that we want them to go home in the same condition that they came, if not better. Yeah. Rachel mentioned that it's behaviour. So getting that behaviour to be embedded in the business week in, week out, day in, day out, it's just that consistent approach and we're now at that stage, we're trying to, you have to try and innovate to the next step, not so much to change what you're doing, but to keep that involvement, keep it fresh, keep it new, when it is actually the same thing that we're still talking about. We've been talking about road safety on our TVs for 30 years, 40 years at least. Yes, the road, the vehicles have changed, but our driver behaviours are still not there, and so it's not just a Sanofi issue for us, it is a community issue. So it is all our employees, their families and protecting them with that process. So Tania, from a research, grey fleet research perspective, what are the next steps that you see? Well, I think here in Australia we all regard that as being almost a right to get into a vehicle, to get on a motorcycle, to get on a bicycle and use that to travel to our workplace or travel for work. What particularly interests me I think is the impact on small and medium enterprises, and even at the lower end, people who are working casually, people who are in the gig economy, people who are traveling from one casual job to another and how these grey fleet issues impact them. Most of those people are going to be driving in vehicles that are much older. Many of them won't even have property insurance for those vehicles. And so these issues are really important for them. I'd like to explore how we can move the discussion that we've been having today down so that it reaches those people. That's really great. Thank you very much. I'd like to thank each of our presenters today for their contribution. As you can see there's numerous challenges in this growing area. For more information regarding grey fleet management or workplace road safety more broadly, please refer to the NRSPP website. We invite organisations to join the partnership. After all, people are important, and the safety of workers just makes good business sense. For the panel, thank you very much for your time today.